Pathfinder Step Treads are an ideal stair complement. 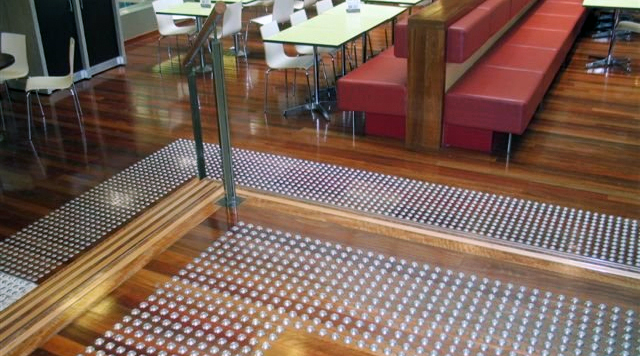 The treads can be used to enhance existing stairs or stair wells, offer excellent slip resistance to the edge of the step as well as protecting the edge from wear. Grip discs are an ideal measure to provide slip resistance against slippery surfaces. Pathfinder is a provider of Architectural Entrance Matting designed and manufactured to the highest quality for use across commercial, community and government buildings. In 1998 Pathfinder Systems recognised the need for a simpler and more cost effective system to be developed to cope with the needs and criteria facing various stake holders. A high priority to all has been and continues to be (now under Pathfinder Systems Australia) to provide minimal disruption to pre-existing public sites. Pathfinder Systems Australia due to its innovative ways has been well received in the Building & Construction Industry here in Australia and overseas as well as with Local Councils and Government Departments. Over the years, we have brought together a network of accredited agents / applicators to service customers across Australia and New Zealand.